Preheat oven to 325 degrees. Place cream in medium saucepan and add vanilla bean paste. Bring mixture to a simmer over medium heat, stirring occasionally. Remove from heat. While vanilla cream is heating, whisk egg yolks and ½ c sugar in medium metal bowl to blend. Set over a saucepan of simmering water, not allowing bowl to touch water. Whisk vigorously until yolk mixture is pale yellow and hot to touch, about 3 minutes. Remove from heat. Gradually whisk hot cream mixture into egg yolk mixture to blend. Divide cream mixture into 6 oven safe ramekins. Arrange ramekins in a large baking dish and pour hot water into pan, enough so that it comes half way up the sides of the ramekins. Bake 40 minutes or until custard is almost set in the center and is light golden brown on top. Remove from water and refrigerate overnight. 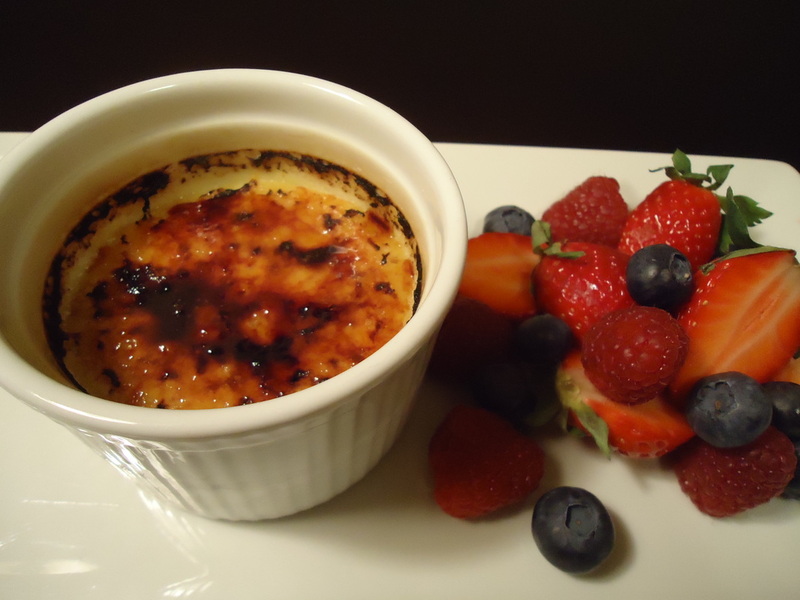 Sprinkle 1 teaspoon of sugar atop each serving of crème brulee. Using a kitchen torch, caramelize sugar until dark golden brown. Let sugar harden for 3-5 minutes. Garnish with fresh berries and serve.